The air museum has a single large display hangar for our larger aircraft, plus of course a range of other buildings to house exhibits. Each autumn, we undertake a big move around to best protect some of the more vulnerable aircraft from the British winter. Some of the more hardy are ‘winterised’ to help them through, while other aircraft, such as the more vulnerable or those that have winter restoration planned, are moved inside. We always have to try and strike a balance between protecting the valuable aircraft whilst still making them visible to winter visitors. While some people comment that they wish there was more space between the indoors aircraft in winter time, this is the reason why we do it. This past Tuesday was the day we managed to finally get a weather window to do our big move around. We know that many people ask us to try and give some notice when we’re going to do this, so that they can capture pictures of aircraft normally living indoors, but the vagaries of the British weather, plus the logistics of getting engineering volunteer staff in place mean that we often have to make snap decisions. This winter’s hibernation move actually happened later than we would have wished, but the high winds and rain we’ve experienced recently enforced some frustrating delays. 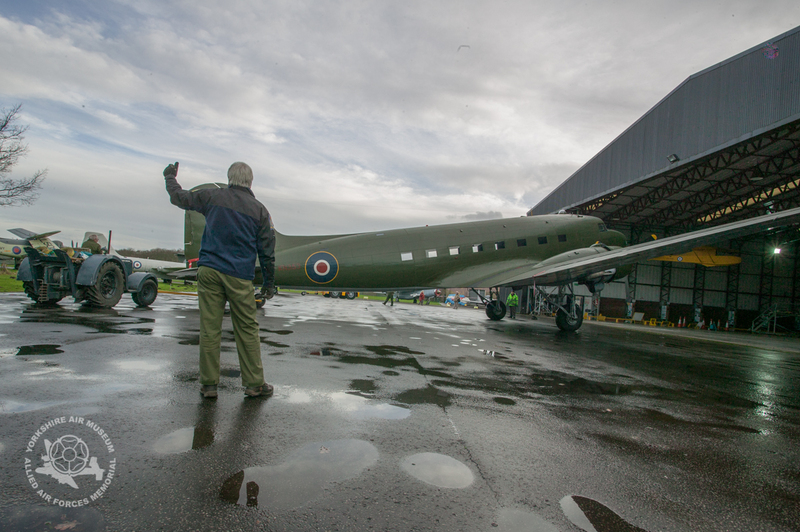 It was a very busy day, as firstly the large Dakota was moved outside, then the Dove, Hunter and even the Messerschmitt briefly saw some daylight! Aircraft tug manoeuvring is a bit of a dark art, a skill which the ex-Royal Air Force engineers in our team have learned over many years on the military flight line. Just moving an aircraft a few feet to one side can often mean reversing all the way back out and starting over. The heavy duty NATO spec tow bars have articulation at each end. If you think that parking your caravan tidily was difficult, you might like to consider reversing a Lightning jet or a huge Dakota with it’s castoring tail wheel. Like no tow bar you’ve ever used. Another project seeing the light of day after a very long period is our Anson. Tuesday saw her being moved across to the main hangar for winter work as the low sunshine shone on her sides for the first time in many years. Packed inside now is our Harrier GR4, plus the Lightning and other regular hangar residents, all in tight below the Dakota’s wingtips. We finally managed to finish everything as the last rays of sunlight dropped below the horizon. We’ve a range of projects to undertake throughout the winter and we’ll be writing more about these as they happen. If you’re interested in helping our progress, our online shop now allows you to sponsor an aircraft and help to maintain and ensure the future of the collection. A great gift for someone and a way of helping the museum preserve these aircraft for future visitors. The hangar is open as usual throughout the winter. If you’re taking a stroll around the collection, you might like to try and imagine how we parked all of those aircraft without saying ‘Ooops!’ As with many things in life, practice makes perfect.